Definition at line 33 of file CChemEq.h. Definition at line 36 of file CChemEq.h. Definition at line 30 of file CChemEq.cpp. Definition at line 40 of file CChemEq.cpp. Definition at line 50 of file CChemEq.cpp. Adds an element to the vector given by structure. The element is either SUBSTRATE or PRODUCT. Definition at line 180 of file CChemEq.cpp. References CCopasiVector< T >::add(), CChemEqElement::getMetaboliteKey(), CChemEqElement::getMultiplicity(), CChemEqElement::setMultiplicity(), CCopasiVector< T >::size(), and SUBSTRATE. Referenced by addMetabolite(), and setMultiplicity(). Definition at line 80 of file CChemEq.cpp. References addElement(), fatalError, mBalances, mModifiers, MODIFIER, mProducts, mSubstrates, PRODUCT, CChemEqElement::setMetabolite(), CChemEqElement::setMultiplicity(), and SUBSTRATE. Referenced by CReaction::addModifier(), CReaction::addProduct(), CReaction::addSubstrate(), SBMLImporter::applyStoichiometricExpressions(), SBMLImporter::isMassActionExpression(), CReaction::loadOneRole(), and CChemEqInterface::writeToChemEq(). Definition at line 52 of file CChemEq.cpp. References CCopasiVector< T >::cleanup(), mBalances, mModifiers, mProducts, and mSubstrates. Referenced by CChemEqInterface::writeToChemEq(), and ~CChemEq(). Retrieves the vector of metabolites and their total balance in the chemical reaction. Definition at line 69 of file CChemEq.cpp. Referenced by CMathReaction::initialize(), and CMMLOutput::writeRHS(). Returns the number of compartments the chemical equation is associated with. Definition at line 110 of file CChemEq.cpp. Referenced by CChemEqInterface::getCompartment(), CReaction::getCompartmentNumber(), test000091::test_delay_in_kinetic_law(), test000091::test_delay_in_kinetic_law_local_parameter(), test000033::test_hasOnlySubstanceUnits(), test000022::test_hasOnlySubstanceUnits(), test000043::test_hasOnlySubstanceUnits(), test000026::test_hasOnlySubstanceUnits(), test000041::test_hasOnlySubstanceUnits(), test000040::test_hasOnlySubstanceUnits(), test000039::test_hasOnlySubstanceUnits(), test000038::test_hasOnlySubstanceUnits(), test000037::test_hasOnlySubstanceUnits(), test000036::test_hasOnlySubstanceUnits(), test000034::test_hasOnlySubstanceUnits(), test000035::test_hasOnlySubstanceUnits(), test000021::test_hasOnlySubstanceUnits(), test000025::test_hasOnlySubstanceUnits(), test000031::test_hasOnlySubstanceUnits(), test000042::test_hasOnlySubstanceUnits(), test000029::test_hasOnlySubstanceUnits(), test000028::test_hasOnlySubstanceUnits(), test000027::test_hasOnlySubstanceUnits(), test000023::test_hasOnlySubstanceUnits(), test000032::test_hasOnlySubstanceUnits(), test000030::test_hasOnlySubstanceUnits(), test000024::test_hasOnlySubstanceUnits(), test000045::test_stoichiometricExpression(), test000044::test_stoichiometricExpression(), and test000046::test_stoichiometricExpression(). Retrieves a set of the compartments. Definition at line 115 of file CChemEq.cpp. References CCopasiVector< T >::begin(), CCopasiVector< T >::end(), and mBalances. Referenced by CMathObject::compileFlux(), and getCompartmentNumber(). Retrieve the largest compartment that the reaction touches. This is time dependent it can only be called after update initial values has been called. Note for an empty reaction a NULL pointer is returned. Definition at line 137 of file CChemEq.cpp. References C_FLOAT64, C_INVALID_INDEX, mProducts, mSubstrates, and CCopasiVector< T >::size(). Definition at line 66 of file CChemEq.cpp. Referenced by CModelAdd::addReactions(), CModelAnalyzer::checkReaction(), CReaction::compile(), ReactionsWidget1::copy(), SBMLImporter::createCReactionFromReaction(), CSBMLExporter::createReaction(), CLayoutInitializer::createReactionGlyph(), SBMLImporter::doMapping(), CModelExpansion::duplicateReaction(), CChemEqInterface::loadFromChemEq(), CModelMerging::mergeMetabolites(), CReaction::object2variable(), CModelAdd::reactionInvolvesCompartment(), CModelExpansion::replaceInReaction(), CCopasiXML::saveModel(), SBMLImporter::setCorrectUsage(), CLLayoutRenderer::setDeduceSpeciesReferenceRoles(), test000091::test_delay_in_kinetic_law(), test000091::test_delay_in_kinetic_law_local_parameter(), test000031::test_hasOnlySubstanceUnits(), test000029::test_hasOnlySubstanceUnits(), test000028::test_hasOnlySubstanceUnits(), test000027::test_hasOnlySubstanceUnits(), test000035::test_hasOnlySubstanceUnits(), test000039::test_hasOnlySubstanceUnits(), test000034::test_hasOnlySubstanceUnits(), test000023::test_hasOnlySubstanceUnits(), test000042::test_hasOnlySubstanceUnits(), test000021::test_hasOnlySubstanceUnits(), test000036::test_hasOnlySubstanceUnits(), test000037::test_hasOnlySubstanceUnits(), test000025::test_hasOnlySubstanceUnits(), test000024::test_hasOnlySubstanceUnits(), test000030::test_hasOnlySubstanceUnits(), test000041::test_hasOnlySubstanceUnits(), test000026::test_hasOnlySubstanceUnits(), test000033::test_hasOnlySubstanceUnits(), test000032::test_hasOnlySubstanceUnits(), test000022::test_hasOnlySubstanceUnits(), test000038::test_hasOnlySubstanceUnits(), test000043::test_hasOnlySubstanceUnits(), test000040::test_hasOnlySubstanceUnits(), test000045::test_stoichiometricExpression(), test000044::test_stoichiometricExpression(), test000046::test_stoichiometricExpression(), and CLLayoutRenderer::update_associations(). Definition at line 210 of file CChemEq.cpp. References fatalError, mModifiers, MODIFIER, mProducts, mSubstrates, PRODUCT, CCopasiVector< T >::size(), and SUBSTRATE. Retrieves the vector of products and their multiplicity in the chemical reaction. Definition at line 63 of file CChemEq.cpp. Referenced by CModelAdd::addReactions(), CModelAnalyzer::checkReaction(), CReaction::compile(), CModel::convert2NonReversible(), ReactionsWidget1::copy(), SBMLImporter::createCReactionFromReaction(), CSBMLExporter::createKineticLaw(), CSBMLExporter::createReaction(), CLayoutInitializer::createReactionGlyph(), SBMLImporter::doMapping(), CModelExpansion::duplicateReaction(), CODEExporter::exportKineticFunction(), SBMLImporter::findCorrespondingFunction(), CChemEqInterface::getCompartment(), CEFMTask::getNetReactionData(), CEFMTask::getSpeciesChanges(), is_mass_action(), SBMLImporter::isMassActionExpression(), CODEExporterC::KineticFunction2ODEmember(), CChemEqInterface::loadFromChemEq(), CModelMerging::mergeMetabolites(), CReaction::object2variable(), CModelAdd::reactionInvolvesCompartment(), CModelExpansion::replaceInReaction(), CCopasiXML::saveModel(), SBMLImporter::setCorrectUsage(), CLLayoutRenderer::setDeduceSpeciesReferenceRoles(), CReaction::setScalingFactor(), test000091::test_delay_in_kinetic_law(), test000091::test_delay_in_kinetic_law_local_parameter(), test000029::test_hasOnlySubstanceUnits(), test000021::test_hasOnlySubstanceUnits(), test000022::test_hasOnlySubstanceUnits(), test000034::test_hasOnlySubstanceUnits(), test000023::test_hasOnlySubstanceUnits(), test000037::test_hasOnlySubstanceUnits(), test000043::test_hasOnlySubstanceUnits(), test000041::test_hasOnlySubstanceUnits(), test000035::test_hasOnlySubstanceUnits(), test000033::test_hasOnlySubstanceUnits(), test000039::test_hasOnlySubstanceUnits(), test000031::test_hasOnlySubstanceUnits(), test000038::test_hasOnlySubstanceUnits(), test000032::test_hasOnlySubstanceUnits(), test000025::test_hasOnlySubstanceUnits(), test000036::test_hasOnlySubstanceUnits(), test000027::test_hasOnlySubstanceUnits(), test000042::test_hasOnlySubstanceUnits(), test000028::test_hasOnlySubstanceUnits(), test000030::test_hasOnlySubstanceUnits(), test000026::test_hasOnlySubstanceUnits(), test000024::test_hasOnlySubstanceUnits(), test000040::test_hasOnlySubstanceUnits(), test000045::test_stoichiometricExpression(), test000044::test_stoichiometricExpression(), test000046::test_stoichiometricExpression(), and CLLayoutRenderer::update_associations(). Definition at line 77 of file CChemEq.cpp. Referenced by SBMLImporter::doMapping(), is_mass_action(), SBMLImporter::isMassActionExpression(), CReaction::isReversible(), and CChemEqInterface::loadFromChemEq(). Retrieves the vector of substrates and their multiplicity in the chemical reaction. Definition at line 60 of file CChemEq.cpp. 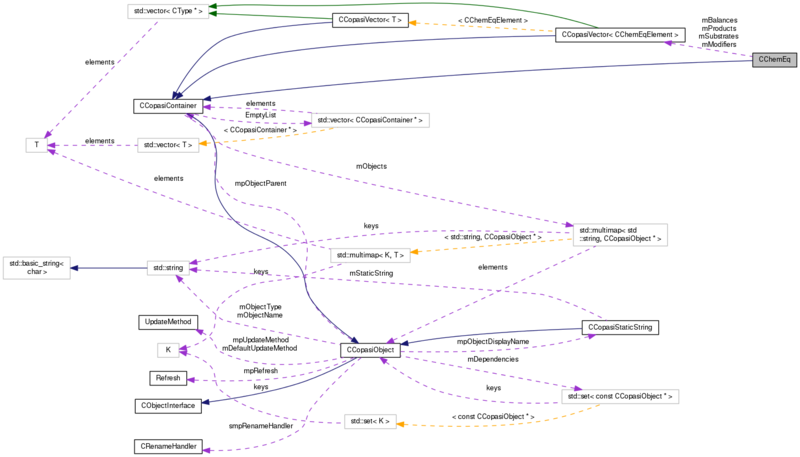 Referenced by CModelAdd::addReactions(), SBMLImporter::applyStoichiometricExpressions(), CModelAnalyzer::checkReaction(), CReaction::compile(), CMathObject::compilePropensity(), CModel::convert2NonReversible(), ReactionsWidget1::copy(), SBMLImporter::createCReactionFromReaction(), CSBMLExporter::createKineticLaw(), CSBMLExporter::createReaction(), CLayoutInitializer::createReactionGlyph(), SBMLImporter::doMapping(), CModelExpansion::duplicateReaction(), CODEExporter::exportKineticFunction(), SBMLImporter::findCorrespondingFunction(), CChemEqInterface::getCompartment(), CEFMTask::getNetReactionData(), CEFMTask::getSpeciesChanges(), is_mass_action(), SBMLImporter::isMassActionExpression(), CODEExporterC::KineticFunction2ODEmember(), CChemEqInterface::loadFromChemEq(), CModelMerging::mergeMetabolites(), CReaction::object2variable(), CModelAdd::reactionInvolvesCompartment(), CModelExpansion::replaceInReaction(), CCopasiXML::saveModel(), SBMLImporter::setCorrectUsage(), CLLayoutRenderer::setDeduceSpeciesReferenceRoles(), CReaction::setScalingFactor(), test000091::test_delay_in_kinetic_law(), test000091::test_delay_in_kinetic_law_local_parameter(), test000034::test_hasOnlySubstanceUnits(), test000028::test_hasOnlySubstanceUnits(), test000042::test_hasOnlySubstanceUnits(), test000043::test_hasOnlySubstanceUnits(), test000021::test_hasOnlySubstanceUnits(), test000035::test_hasOnlySubstanceUnits(), test000022::test_hasOnlySubstanceUnits(), test000040::test_hasOnlySubstanceUnits(), test000029::test_hasOnlySubstanceUnits(), test000036::test_hasOnlySubstanceUnits(), test000039::test_hasOnlySubstanceUnits(), test000031::test_hasOnlySubstanceUnits(), test000032::test_hasOnlySubstanceUnits(), test000041::test_hasOnlySubstanceUnits(), test000030::test_hasOnlySubstanceUnits(), test000024::test_hasOnlySubstanceUnits(), test000037::test_hasOnlySubstanceUnits(), test000033::test_hasOnlySubstanceUnits(), test000026::test_hasOnlySubstanceUnits(), test000027::test_hasOnlySubstanceUnits(), test000038::test_hasOnlySubstanceUnits(), test000023::test_hasOnlySubstanceUnits(), test000025::test_hasOnlySubstanceUnits(), test000044::test_stoichiometricExpression(), test000045::test_stoichiometricExpression(), test000046::test_stoichiometricExpression(), and CLLayoutRenderer::update_associations(). Sets the stoichiometry of the chemical element that corresponds to the given metabolite and role to the new value. The role has to be either CChemEqElement::SUBSTRATE or CChemEqElement::PRODUCT. If the role is invalid, the multiplicity is negative or zero or if the element for the metabolite and role can not be found in the chemical equation, false is returned and nothing is changed. Sets the stoichiometry of the chemical element that corresponds to the given metabolite and role to the new value. The role has to be either CChemEqElement::SUBSTRATE or CChemEqElement::PRODUCT. If the role is invalid, the multiplicity if negative or if the element for the metabolite and role can not be found in the chemical equation, false is returned and nothing is changed. Definition at line 268 of file CChemEq.cpp. References addElement(), CCopasiVector< T >::begin(), C_FLOAT64, CCopasiVector< T >::end(), CModelEntity::getKey(), mBalances, mProducts, mSubstrates, PRODUCT, CChemEqElement::setMultiplicity(), and SUBSTRATE. Definition at line 72 of file CChemEq.cpp. Referenced by CReaction::load(), CReaction::setReversible(), and CChemEqInterface::writeToChemEq(). Definition at line 242 of file CChemEq.cpp. Definition at line 216 of file CChemEq.h. Referenced by addMetabolite(), cleanup(), getBalances(), getCompartments(), operator<<(), and setMultiplicity(). A vector of modifiers in the chemical reaction. Definition at line 209 of file CChemEq.h. Referenced by addMetabolite(), cleanup(), getModifiers(), and getMolecularity(). Definition at line 204 of file CChemEq.h. Referenced by addMetabolite(), cleanup(), getLargestCompartment(), getMolecularity(), getProducts(), operator<<(), and setMultiplicity(). Definition at line 190 of file CChemEq.h. Referenced by getReversibility(), and setReversibility(). Definition at line 197 of file CChemEq.h. Referenced by addMetabolite(), cleanup(), getLargestCompartment(), getMolecularity(), getSubstrates(), operator<<(), and setMultiplicity().